If you're a fan of comfort dressing when it comes to your personal style, you'll love this super cute combination of a dark green oversized sweater and Frame Denim ripped skinny jeans. Amp up the cool of your look by rounding it off with tan suede ankle boots. If you're scouting for a casual yet totally stylish getup, consider teaming a grey fur coat with Frame Denim ripped skinny jeans. Both pieces are totally comfy and will look fabulous paired together. Why not add white canvas low top sneakers to the mix for a more relaxed feel? 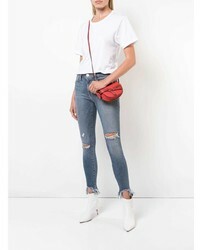 If you're a fan of functionality dressing when it comes to your personal style, you'll love this totally stylish combination of a black off shoulder top and Frame Denim ripped skinny jeans from farfetch.com. Bump up the cool of your look by complementing it with black chunky leather ankle boots. This pairing of a beige long sleeve t-shirt and Frame Denim ripped skinny jeans is very easy to create and so comfortable to wear all day long as well! Let's make a bit more effort now and grab a pair of charcoal suede ankle boots. If you're a fan of relaxed dressing when it comes to your personal style, you'll love this chic combo of a black knit cropped sweater and Frame Denim ripped skinny jeans. Make black leather mules your footwear choice to instantly up the chic factor of any outfit. We're all seeking comfort when it comes to dressing up, and this combination of a black and white print crew-neck sweater and blue ripped skinny jeans is a wonderful example of that. Up the cool of your ensemble by complementing it with black cutout leather ankle boots. 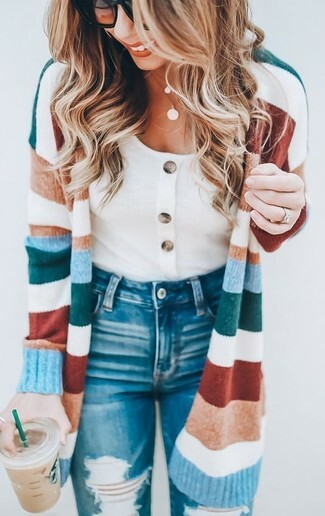 We're all seeking comfort when it comes to dressing up, and this combination of a multi colored horizontal striped long cardigan and blue ripped skinny jeans is a vivid example of that. If you're in search of a casual yet absolutely chic getup, team a yellow coat with blue ripped skinny jeans. Both garments are totally comfy and will look fabulous paired together. Add a glam twist to your look with navy suede pumps. If you're a fan of comfort dressing when it comes to fashion, you'll love this super cute pairing of a black leather biker jacket and Frame Denim ripped skinny jeans. Bump up the cool of your outfit by wearing black suede ankle boots.